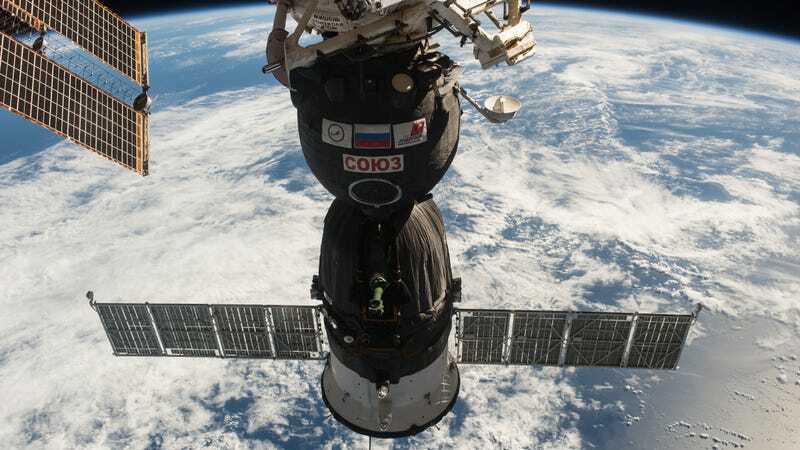 A tiny hole in a Soyuz spacecraft attached to the International Space Station has turned into a strange game of international telephone. Scientists immediately determined that the pressure leak in the capsule attached to the ISS, first detected on August 30, wasn’t a big deal—the astronauts were never in danger of running out of air or of being sucked into space. But back on Earth, the CEO of Russian space agency Roscosmos suggested sabotage, saying he wouldn’t rule out that the hole was made through “deliberate spoilage.” This has somehow spiraled into claims—and denials— that Russian leaders had accused US astronauts of secretly drilling the hole. NASA first reported signs of a tiny pressure leak in the ISS on August 30, and deemed that the astronauts were not at risk. Analysis revealed that the leak came from a hole in the Soyuz MS-09 module docked to the ISS, which arrived in June. The astronauts patched the hole with tape and then epoxy, fixing the problem. Some speculated at first that the damage could have been caused by a micrometeorite. But then, everyone saw a photo of the hole—which certainly looked as though it were created from inside the capsule by a drill. Roscosmos CEO Dmitry Rogozin said perhaps the hole was caused by an error during the manufacturing process. He did not rule out any options, though, including that someone drilled the hole intentionally, in Earth or in space. “I can unequivocally say that the crew had nothing to do with this on orbit, without a doubt, and I think it’s actually a shame and somewhat embarrassing that anybody is wasting any time talking about something that the crew was involved in,” Feustel said. Today, the Russian state-run RIA Novosti news agency published a story with a statement from Yury Borisov, deputy prime minister of Russia for Defense and Space Industry, denying that American astronauts were under suspicion. He said it was too early to speculate and asked people to wait until for the release of a report on the incident. “It’s absolutely inappropriate to [compromise the reputation] of either our cosmonauts, or of American astronauts,” Borisov said. Gizmodo has reached out to NASA for comment and will update the post when we hear back. Essentially, the module is spherically shaped, and drilling holes in microgravity requires anchoring onto something. It’s possible that one astronaut could have held onto another in order to drill the hole, but “no one would endanger their situation in such a way,” De Leon said. A feud between the US and Russia, a mysterious hole in the ISS, and accusations of sabotage have all of the makings of a knock-off James Bond movie, but the truth is likely more mundane. Nevertheless, we won’t know what happened until the investigation is complete. Russian translations provided by Marina Galperina.